Around the world, one out of every six human beings lives in extreme poverty, struggling to survive on about one dollar a day. The majority of those people are women. What is living on a dollar a day really like? Ritu Sharma, president and cofounder of Women Thrive Worldwide, goes to Guatemala to find out. I decided to try living on a dollar a day last year when I was in Nicaragua. There are about 1.4 billion people worldwide, most of whom are moms and kids, in extreme poverty. This is defined as living on approximately one dollar per day or less. Often, that dollar has to pay not just for one person's needs, but for those of a whole family. As President and Cofounder of Women Thrive Worldwide, I spend my days in Washington, D.C., advocating on behalf of the world's most impoverished women. I wanted to see how far a dollar would go, and to feel, if even in a small way, what it is like to be that poor. I can never fully understand how the world looks through the eyes of a woman living in poverty, but if I can have a small window into her experience, I think I can be a more empathetic advocate on her behalf. This year, for four days, I lived in the municipality of Tactic (pronounced "tack - TEEK") in the area of Alta Verapaz, Guatemala. It is a lush and mountainous region that contains some of the most desperate poverty in Latin America. I wore the same clothes, ate only what eight Quetzales, the equivalent of one dollar, would buy me, and spent as much time as possible with two incredible Mayan women--Dorotea and Eluvia--who live on a dollar or less every day of their lives. The following is an excerpt from the diary I wrote during the trip. Following a bumpy ride in the back of a pickup truck, we arrive in the community of Tzalem, about an hour from Tactic's town center. We walk up a steep mountain of corn stalks to the house of Dorotea. Meeting Dorotea is an entirely different experience: her eyes are pale, her skin is sallow, and she is clearly tired. She explains to us that she has been feeling very sick, but because she and her husband make only 20Q ($2.40), which they must divide among their four young children, she simply does not have the money to pay for both food and medicine. The only doctor is a 10Q ($1.20) truck ride away, and costs 100Q ($12.00) for one consultation, not including medicine. Like most women in Tzalem, Dorotea uses local herbs to try to treat her illness. Dorotea invites us into her house. She is with her six-year-old daughter, Elvira, cooking a substitute for soup composed of water, "herbs," which are essentially weeds that grow wild on the hillside, and spices. Spices are the key to managing hunger. They calm the appetite when there is no real food. 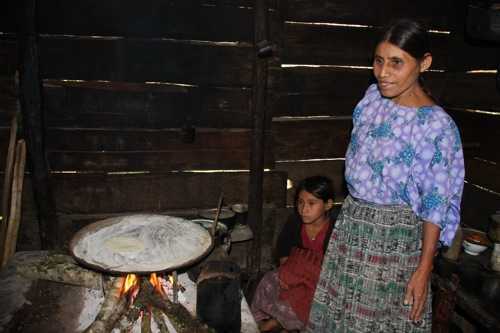 The very poor often have a tortilla with a spread made from chilies and lard sprinkled with salt. I love cooking, and to me spices are small fragrant things you add to your dish using more intuition than recipe. I had never thought of them as a staple food. Still, today I am grateful to have something for lunch that is "free" because it is picked from the countryside. Dorotea and her husband are share croppers--they do not own their house or land but "rent" them in exchange for half of their corn crops. Ironically, this lowers their yield because they do not have the land collateral needed to receive a loan for seeds or fertilizers. 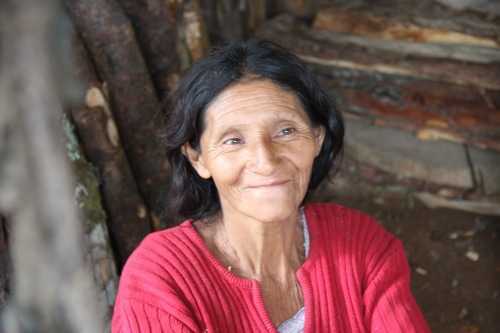 I know from all of Women Thrive's work helping women get property rights that just owning her own land would probably give Dorotea the boost she needed to escape poverty. We arrive at the house of Eluvia, where she and her husband, Fernando, are sitting together under a grass canopy, while her two daughters Maria and Olivia, play in the dirt compound that is their home. Eluvia is weaving and Fernando is shucking corn kernels they recently picked from the field. She is making a traditional huipil (pronounced xhui-PEEL), a colorful hand-woven fabric, for a child's clothes. Though they take many hours to make, she sells them in Tactic for only 30Q ($3.60). While the price of yarn has gone up, the price of huipiles has collapsed, making it difficult for her to earn a living from her trade. Talented weavers like Eluvia do not have the transportation, capital, or marketing skills they need to expand their weaving into a larger business. 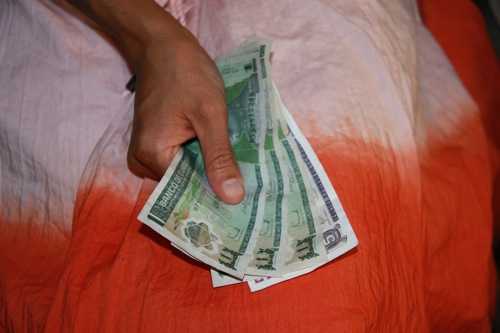 Eluvia's family of six must typically subsist on the meager 20Q ($2.40) she and her husband bring in each day from farming. I decide to buy one for 50Q to display in our office. She can barely contain her smile, and pretty soon it's cheek-to-cheek. I know that there are thousands of other women like me in the States who would buy Eluvia's fabric. 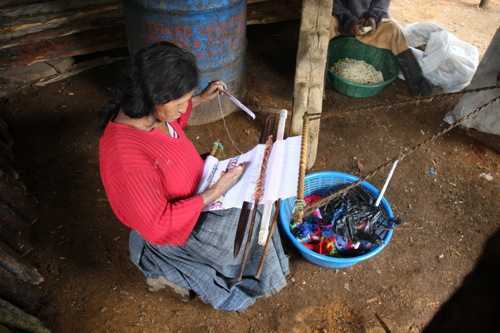 This is exactly why we need to make trade work for women - to help women like Eluvia access willing markets and use their art to escape poverty. When I ask Eluvia what makes her happy, her features soften as she thinks for a while. She then says simply, "flowers." She grows flowers whenever she can and wherever she can make space for them. Once in a while she'll cut them and walk three hours into Tactic to sell them for a few Quetzales per dozen. We have returned from Tzalem and I am still hungry. I'm running through a mental list of what I could eat. Fruit-too expensive. Soup-out of the question. Chicken-dream on. So, once again, I have my staple-of-the-world beans and rice. This is my last meal of the day. Guess it's time to pay the piper. I'll be going to bed hungry tonight. Join the Dollar-a-Day Circle, and help women thrive around the world. Read the rest of my Dollar Diary here. How much can a dollar buy in food? Click here to see for yourself.